The Green Team has a new display in All Saints and has produced some useful information about recycling. 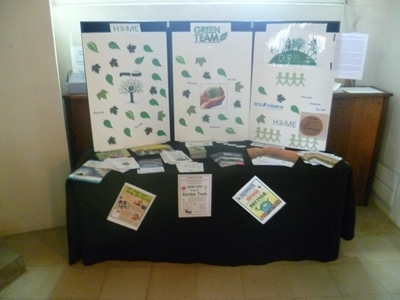 With the harvest season underway, the All Saints Green Team has mounted a display in All Saints church until the end of October to draw attention to the need to protect the earth’s resources and promote climate justice. There are newly produced leaflets from USPG showing the increasingly devastating impact of human generated climate change on Christian communities round the globe, and ideas for prayers and action. Also available is an updated version of the Green Team’s sustainability guide with suggestions for minimising energy consumption and helping to reduce harmful carbon emissions as well as saving money with colder weather on the way. The Green team has updated their useful leaflet listing all the places locally where we can recycle unwanted goods. Download the "Recycle" leaflet below. They have also produced a leaflet explaining how we can care for God's world and reduce our footprint. Download the "Footprint" leaflet below. The Green Team are currently collecting garden tools that can be reconditioned by prisoners at HMP Wandsworth and donated to community projects. Check the "Tools" leaflet below for details of how to donate your unwanted garden tools.